PLEASE NOTE: ALL OUR STOCK HAS AN EXPIRATION DATE OF 2008. 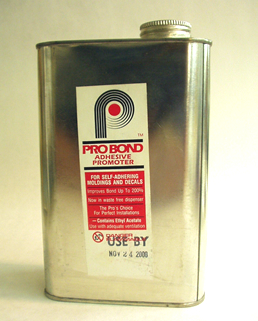 When you use Pro bond adhesive promoter it will improve the adhesion of your vinyl letters and decals by up to 200%. Simply apply it to the surface and let dry. This adhesive promoter will lengthen the life of your installed letters and decals.